Transcending boundaries at Richard Stone’s studio. Richard Stone is an artist who makes art – whether it is sculpture, painting, or installation. His practice is comparable with that of making a music album, in which “a sequence of works capture and exceed a point in time”. Collapsing figuration and abstraction, colour with monochrome, and fluidity with stillness makes Stone’s practice remain recognisable and simultaneously placeless or timeless at the same time. Add to the fact that he explores the idea of sculpture as something much more delicate in expression – counterbalancing what might be seen as traditionally heroic or excessive. This Summer, Stone is working in the studio, and we got a chance to speak with the artist to discuss the handmade and movement in his practice. Richard Stone (b. 1974, UK) studied an MA in Fine Art at Central Saint Martins. 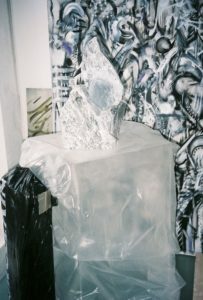 He has exhibited at Art Brussels, Brussels; KinoKino Center for Art and Film KF, Norway; Kristin Hjellegjerde Gallery, London; James Freeman Gallery, London; Royal Society of Sculptors, London, amongst others. Residencies include Atelierhaus Salzamt, Austria, amongst others. He was awarded a Grant for the Arts, Arts Council England and the Brian Mercer Bronze Scholarship, 2013 – 2014, amongst others. Richard is currently living and working in London and Italy. You were given a scholarship from the Royal Society of Sculptors in Italy. Has this nourished your interest in certain materials? I was incredibly fortunate to receive this scholarship to go to Pietrasanta, there aren’t any other scholarships like it. It completely transformed what was possible for me, from the first time I arrived at Fonderia Mariani, to each time I’m back working in the area. Pietrasanta remains a place of infinite possibilities; it is an incredibly rare place for making sculpture. 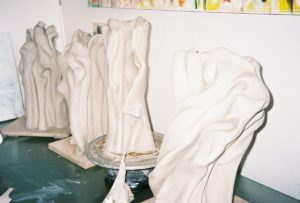 I started working in bronze under the mentorship of Helaine Blumenfeld and we connected in our passion for the ability of material to transcribe feelings as well as taking risks. Since then, I remain immediately struck by the ambition of monumental works coming in and out of the studios and workshops in Pietrasanta including Helaine’s because she understands the complexity of scale perfectly. I’m interested too in the idea of sculpture as something much more delicate in expression, at whatever scale, a counterbalance to what might be seen as traditionally heroic or excessive, which I’ve been exploring in my practice for some time. 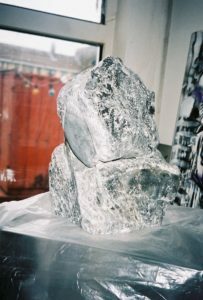 I think that the scholarship nourished me in giving me unique access to working with bronze but also the freedom to explore materials more broadly, including pewter, silver, marble and stone. 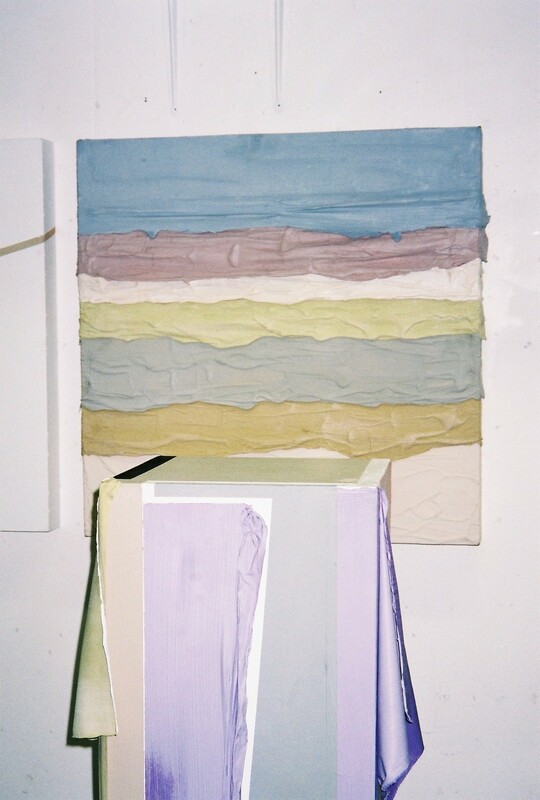 When I recently visited your studio, you mentioned that you “draw into the materials”. Can you explain this process? Is the handmade/touch central to your practice? I don’t make drawings before making sculpture, I rarely use armatures either, I think a sculpture will stay standing or collapse, it will survive, or it won’t. The “drawing” we’re talking about is about having a direct, physical and mental connection to the material and what it wants to yield in that moment, I almost stop thinking when I start to make a work from a block of clay for instance. Something will emerge as line, form, and shape or as a figurative or abstract element, and I then chase the rest of what might become a sculpture out of the clay. There’s a spontaneity as well as a slowness to the rhythm of making that I think is incredibly important to connect with, especially in the quickening of the age we live in. There’s a sensuality to making too, that I think comes through in the finished sculptures, because they’re connected to the human hand and the mind’s ability to draw many references, experiences and emotions together in real space. You work with a variety of materials for your sculptural works, such as porcelain, bronze, wax or marble. What’s your relationship with certain materials and how do you know when a material fits the work best? This is about sensuality too, these materials offer me a connection to myself as a maker, to how I see and interact with the world, to how artists have used these materials before and what they might offer right now. In early works I would mix materials, like metal and wax, earth and flowers, I’m very interested in material combinations. With more recent works, I sense how a maquette or model might translate into another material, it has a lot to do with a sense of weight or balance. For example, if I want a sculpture to feel closer to the air, I will use statuario marble, because of its crystalline clarity and translucency, if closer to the earth, a carrara marble, because of its cooler tone and grain. 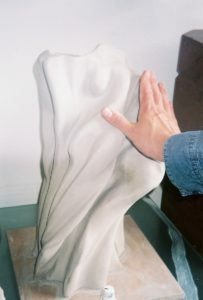 With my most recent marble sculpture tutelar, it took some 18 months from making the model to realising the final sculpture because I was convinced that it had to be statuario marble and I had to wait for the perfect block to be able to afford it. I have some works in the studio that I know will be perfect for bronze and other metals but again I will wait for the right time. 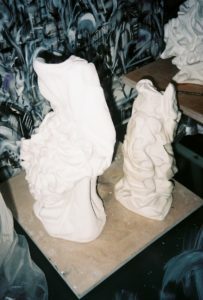 Are you interested in colliding both figurative and abstract in your sculptures? What about the further contrasts in your work, such as the merging of femininity and masculinity? I’m really interested in that exact point when figuration or representation collapses into abstraction, it brings much more fluidity and freedom to the work, whilst allowing it to remain recognisable and simultaneously placeless or timeless. I often think of Schütte’s ‘ghosts’ and their unfixed-ness, a collapsing of figuration and abstraction and I read something that I liked recently about them being equally experimental but very visceral, very human. The merging of femininity and masculinity is really interesting and there are elements of this in the work, but I think it actually comes back to materiality and masculinity, male sensuality. I think there are all sorts of challenges caught up in deconstructing the subjects and aesthetics in traditional sculpture made by men but I’m most struck by sculpture when it can transcend boundaries and hold traditional notions of masculinity and femininity equally. It’s terribly boring to be held back by definitions. 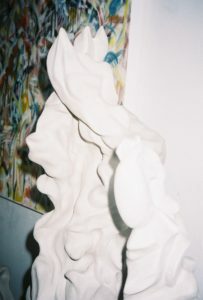 I am curious about the relationship between your painting and your sculptural practices. They both feel very separate yet cohesive at the same time. Do both of these practices work together? Is one a reaction to the other? How comes your painting practice is so vibrant compared to your monochromatic sculptures? There’s so much to say about this, both painting and sculpture have moved in and out of my expression for as long as I can remember, as well as installation, so in this sense, I make no division. I am an artist who makes art, and it is expressed in many different materials, whether that is in painting, sculpture or installation. 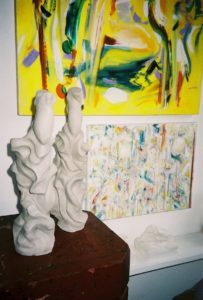 For me, what connects painting and sculpture is something thematic or emotional that comes together as a series of connected works, for an exhibition most obviously. Often my exhibitions are like music albums, a sequence of works that both capture and transcend a point in time. I don’t work on painting and sculpture simultaneously, rather on series of works which inform each other. When I look back at my practice, it really is of course quite eclectic, but there are strong conceptual and aesthetic threads which reoccur throughout. Earlier in my work, I used found objects of painting and sculpture in my work, when I relinquished these, a different energy became part of a new language of making. 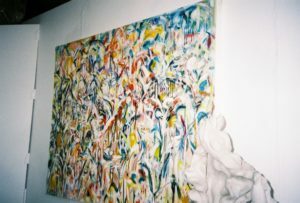 I would say the movement and energy in recent painting and sculptural works are much more connected, you can easily trace a painterly line to a sculptural one and there are more definite synergistic forms and motifs. Finally, I think given where we are in the world, I wanted to create something that felt reflective but more hopeful. The colour came in from connecting to European art history, I wanted to embrace my European identity and not be bound by my British identity. A series of residencies in Linz, Austria informed this too because I met a number of different artists working in very different ways. It’s where I think freer movement and colour started to become clearer in my practice. Read more: Richard Stone: A journey from and to the edge of abstraction. Would you agree in saying that your sculptures seem to capture movement? Is this a desired outcome? Without a doubt, and people have really responded to this in recent works. It goes back to that point of what sculpture can do, it can have great weight and presence, be stoic and it can be equally light and ephemeral with great energy. Your recent flag sculpture is heavy and flat, strong and delicate at the same time. What can you tell us about this piece? Does it have a political connotation? I’m not overtly political, but I don’t live in a vacuum either. With this work, I really liked the idea that a flag is usually placed at a certain spot as a way of marking or claiming a territory. Here, stone, the material of the mountain, is reclaiming its sovereignty. With the suggestion of the flag bearer long defeated, I liked the idea of a really delicate monument left evoking the breeze and an absent figure in sculptural form. It was some coincidence that the work was exhibited during the first Scottish referendum on independence, and I would really like to make a much larger version for the fourth plinth in Trafalgar Square, there amidst the historical heroes. In any case, I’m currently working on new works in this series, which again is a timely, apparently accidental, synchronicity. What can you tell us about your most recent “puzzle” sculptures? How did this method of de-configuring and re-configuring come across your practice? They are a puzzle aren’t they, they have these different forms and movement overlapping, in some way they become almost cubist. It’s not the first time I’ve abstracted sculptural form, but it’s certainly new in that I’m letting them sit and stay a while in the studio. I guess that’s what makes them a puzzle: I don’t know exactly, the process will tell, but I suspect larger forms will emerge. In which moment of your process do you transform yourself from “being a maker” to “being a viewer”? I think these states exist simultaneously in making and viewing, it’s a dance, but I would say the process ultimately lets go of you, there’s a distinct point where you and the work exist separately. I think a great deal of being an artist is perpetually attuning to this. Do you have any projects ahead? In which direction is your work developing? I’m currently exhibiting in sweep ~ landskip in Kinokino, Sandnes, Norway, curated by Roberto Ekholm and including artists such as Derek Jarman and Peter Joseph and some of my most recent hypnotic abstracts paintings are currently on view in the showroom at Kristin Hjellegjerde Gallery in Berlin. New marble and bronze works are in production in Italy. I’m revisiting the flag series in part because there is demand for these works and also because it feels like a poignant moment to be reflecting on nationhood. I’m also exploring bronze works based on my “when history falls silent, the future will fail” figure, which toured Europe with “Nature Morte”. Alongside this, I’m working on staying with my process of making, there’s always the energy of something new in the studio, but it’s not always clear exactly what shape it will take until that moment that everything falls into place.